FAQ: Do you have a 12v latching relay? Please Note: This page is here for legacy purposes only. The impulse latching switch has been replaced by our new educational ESP32 Micropython kit, with a programmable low voltage relay module that has almost unlimited capabilities. Yes, we have an SSR (solid state relay) 'smart switch' with latching and optional timer capabilities! If you have ever had trouble finding a latching relay that is toggled on/off by a momentary 12v pulse, here is a great solution. The programmable nature of this switch means it can be used in many different ways. 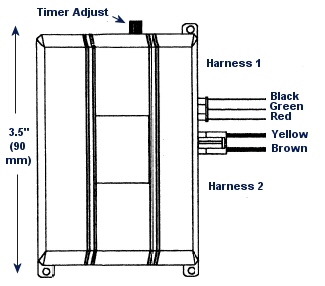 Double pole latching relays require 2 switches to operate, and regular single pole latching relays require polarity reversal to operate. But what if you want to use a momentary contact 12 volt switch to toggle a circuit on and off? Our DCC-2-SW solid state mosfet switch provides a perfect solution. In latching mode, it will trigger with either a momentary pulse or continuous input, whenever a signal is sensed. When that trigger input is applied while it is on (in latching mode), it will turn off. It does not have to be a 12v trigger signal - it could be (for example) a 5 volt TTL input from a microcontroller unit (MCU). The output can be configured as normally on or normally off, and the input can be configured to receive either a positive or negative triggering pulse. It will activate on the leading edge of a negative pulse, or the trailing edge of a positive pulse. There are two timer ranges, from zero to 1 second, or from 1 to 100 seconds. The timed output can be precisely set in either range simply by rotating a small control, accessible at the side of the unit. We sincerely hope you enjoy using these advanced switches; if you have any questions, please feel free to contact us at any time! Copyright © 2010-2018 RollerTrol™ Automation Systems. All Rights Reserved.